So How did the night come about? The night came about very naturally, I was already involved at Corsica with its 'genre smashing' night, Trouble Vision. The club was crying out for a more focussed night for people just that little bit more serious about music, the team at Corsica are very supportive and it is the perfect club for me, size, sound, people. There are hardly any other places id rather put parties on in London to be honest! You've been busy from the very first parties and there is always such a great vibe at CS, why do you think this is? I think luck had a lot to do with it, timing was pretty essential a lot more people getting in to house and techno. I made a few perhaps lucky bookings, getting artists like Bicep, Tornado Wallace and Mano le tough over for some of their first London gigs who have of course since blown up. Our line ups have always been particularly big for the size of the club too, and I try and make the combinations of artists as interesting and as unique as possible. Who does the programming and is it difficult to book the artists that you think combine well individually to play on the same night? I program it all myself really, and yes, it is becoming increasingly difficult to book artists in general in London as a lot of people want similar artists. To get a line up that goes great together booked, it really is a combination of planning ahead, good taste and a whole lot of luck! Of course the reputation at Corsica means booking artists is a lot easier I think as they generally want to come and play here. There's been so many killer kine ups but which has been your favourite night so far? Hmmm, I think maybe the one in February 2012 with Prosumer and San Soda in room 1 and Axel Boman and Midland in room 2, the rooms were balanced so well and both rooms offered something just a little bit different. The Beats in space room in Feb 2013 with Todd Terje, Tim Sweeney and Casino Times was also a bit of a dream. I know there are some festival gigs in the pipeline can you tell us a bit more about these? Sure! We are doing a stage at Garden festival with myself, Ben Sun, Casino Times and Bicep which is going to be killer. We are also running a boat party with Midland, Casino and myself at Dimensions festival and are presenting a stage at Gottwood festival in Wales with Wolf Music. You recently mastered your first two EP's, which artists feature, when are these on release and how many copies are being pressed? So the 2 Eps are from artist who have never released music (under these names) before, so im really happy about that. The first (tief001) is by 'Sisterhood' which i am really amazed at how good it is. The two originals are remixed by Juju & Jordash and Arttu which raise the profile of the release in general and compliment the originals perfectly. The second is by a guy named Esa who i met in Cape Town and Ooft! who produce together as 'Prophets of the south'. Esa produces as himself and is also involved with Auntie Flo and Ooft! of course is a well established producer in his own right. The pairing is great and the 3 tracks they gave me are outstanding, really nice african sounding and almost ravey house. I am pressing 300 of each to begin with, but im sure the demand will be there so will probably up to 500, we arent bothering with all that 'limited numbered' stuff. You've already booked so many outstanding artists is there anyone left on your hit list who would be a dream to book? I have actually already covered a lot of dream bookings to be honest! Pepe Bradock being one of them (who will be playing at our birthday in September). Id love to book Thomas Bangalter of Daft Punk, but realise that this is pretty much impossible..
Ah, Dj Harvey, yeah he is up there. Again is a really long shot but would be killer! 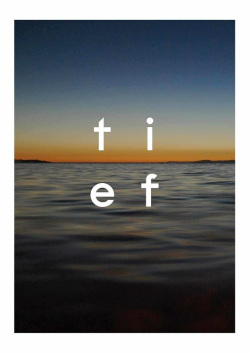 Most club nights have a shelf life, would you ever consider killing off Tief at the height of its popularity to maintain the memories if how special it was? Wow thats a depressing thought! Its not something i would do any time soon at all, as romantic that idea is. There are plenty of new amazing artists and sounds emerging that i am becoming really interested in so im going to have to say no! I am REALLY glad you said that!